A RM12 Engine engineer performing boroscope testing on the fan/compressor blades. GKN Aerospace has gained a USD$175 million three-year contract extension for the technical product support, maintenance and parts supply to the Swedish Armed forces for their Gripen RM12 fighter engines. The Performance Based Logistics (PBL) agreement, with the Swedish Defense Materiel Administration (FMV) extends the company’s existing work on this program until 2020. GKN Aerospace has been a supplier of fighter engines to the Swedish Armed forces since 1930. 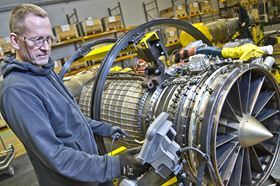 Since 2010 GKN Aerospace has committed to guarantee full availability of the RM12 engines and GKN Aerospace is the type certificate holder of the engine in Sweden.